During the revolution of 1848–49 he was a member of KOSSUTH’s radical reform party. He was elected to the Hungarian Diet in 1847. As a batallion commander, he participated in the armed struggle against the Habsburgs in the War of Independence of 1849. After the defeat of the uprising, he fled abroad, was sentenced to death in absentia, and was in fact hung in effigy in VIENNA’s marketplace. During his exile he visited several west European countries and thoroughly familiarized himself with the intricacies of European politics and diplomacy. Amnestied in 1857, he returned to Hungary. Working hand-in-hand with FERENC DEÁK, he was instrumental in drafting the Hungarian terms of the compromise with the Habsburgs that by painful degrees emerged after Austria’s defeat at the hands of Prussia in the summer of 1866. He was later, together with Deák, one of the participants in Vienna in the discussions that led to the conclusion of the AUSGLEICH in February 1867. From that time on he was continually active in political life, in the service first of Hungary and then of the Dual Monarchy. After the Great Compromise he was named, at the recommendation of Deák, prime minister of Hungary. It was he who placed the crown of St. Stephen on the emperor’s head when the latter was crowned king of Hungary on June 8, 1867. As prime minister he relaxed the stringent censorship of the press that since the revolution had hampered free expression; he also mitigated the repressive legislation against the Jews. Having been born in northern Hungary (in Kassa, in the largely Slovak-populated Uplands), he feared somewhat extravagantly that the Hungarian nation would become submerged in the Slavic sea; for that reason he strongly favored dualism—that is, close links to Austria— as well as alliance or alignment with Germany as a means of keeping Russia, protector of Slavs in the empire and in the Balkans, in check. 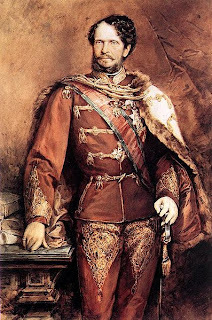 When plans were developed in Vienna for giving Bohemia with its Czech population equal status with Hungary in the monarchy, he strenuously opposed such a measure. In 1871, when Emperor Francis Joseph abandoned his plans for revanche against Germany and sought rapprochement, he dismissed the anti-German FRIEDRICH BEUST as joint foreign minister and, on November 14, 1871, appointed Andrássy in his stead. The brunt of Andrássy’s foreign policy was resistance to Russian expansion in the Balkans and curbing Serbian ambitions to become the center of a South Slav federation. When revolt broke out in BOSNIAHERCEGOVINA against Ottoman rule in 1875, he strongly advocated the absorption of those provinces into the Dual Monarchy, as well as that of the sanjak of Novibazar, which separated Serbia from Montenegro and which in Austrian hands could serve as an Ausfalltor (springboard) for the monarchy into the Balkans toward Saloniki. He achieved these goals at the CONGRESS OF BERLIN in the summer of 1878, following a war between Russia and Turkey. Pleading ill health, but most likely because he was discomfited by criticisms of his Balkan policy, he resigned as foreign minister on October 8, 1879. First, however, he put his signature to an Austro-Hungarian alliance with Germany, directed chiefly against Russia. He remained a member of the Hungarian upper house to the end of his life.